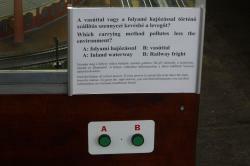 The first installation at the Hungarian Railway Museum within the framework of the Museo Mundial Project focuses on environmentally friendly transport and transit systems. These topics are a perfect fit for this museum. Although rail transport has already proven to be the most environmentally friendly solution to public and freight transportation, the introduction of the Siemens Vectron locomotive, which meets modern technical requirements, was a significant step in the development of the Hungarian railway. 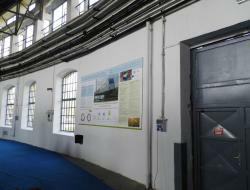 We have installed an exhibition tool in the “Orient Hall”, one of our main exhibition halls. We hung an exhibition board on the wall in front of a table displaying a model railway. The board displays information on the global environmental impact of CO2 emissions as well as information on possible solutions through the use of spectacular graphics and charts. 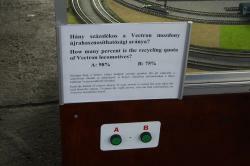 The interactive element of the installation is provided by a plotting board on which a model Vectron locomotive draws a carriage, and it can easily be operated by children. The installation consists of an exhibition board (size 4m x 2m) with relevant data providing information on the contribution of CO2 emissions to climate change. It provides information on the complex web of causes, effects and consequences of global warming, such as rising sea levels due to the rapid melting of the polar ice caps and ocean acidification. The installation includes infographics explaining the rapid rise in world temperatures. By referring to extreme weather conditions in Hungary, the installation sheds light on issues in so-called developing countries where these kinds of extreme conditions and their effects on the environment threaten the lives of local inhabitants (Mali and Senegal). We have used a spectacular diagram to demonstrate that the railway is by far the most environmentally friendly solution to transport and transit, as it generates less environmental pollution than any other competing transport system. We familiarize our visitors with the Siemens Vectron train that has recently been purchased by the MÁV (Hungarian State Railways). The installation graphics highlight that not only does the train require less energy to operate, but, also, that its manufacturing process is environmentally sound. We also emphasise the fact that the Vectron engine is 98% recyclable. The installation is linked to Millennium Development Goal 7 (“Ensure environmental sustainability”). Select a theme that fits the profile of the museum and an installation that fits this theme. In our case, it is an exhibition board hanging on the wall and an interactive plotting board. We collected data from the fields of public and freight transportation that demonstrates the clear advantages of rail transportation. Find partners to implement the installation. In our case, we cooperated with representatives of Siemens in Hungary. They helped us collect all the documents demonstrating the environmentally friendly credentials of Siemens Vectron locomotives, both in terms of their production process and their actual operation. Collect the data, graphics and photos to be displayed on the board. We requested quotes for the graphic design, manufacturing and transportation of the board, as well as for the installation of the plotting board. We agreed with the graphic artist on the amount of data to be displayed on the board and we asked to see some drafts. Correcting any errors, leaving some information out and including other information, always aiming to be as informative as possible. 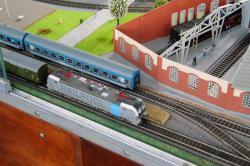 The interactive plotting table and two Siemens Vectron locomotive models have to be ordered. After finalizing the graphic designs, we sent all the materials to the printers, who printed and laminated the board. Once it had been delivered to the museum, the staff installed it on the wall. In addition, the plotting table, which children can operate by pushing two buttons and answering two questions correctly, had to be installed. Our installation perfectly fits the profile of the Hungarian Railway Museum. The spectacular, aesthetically pleasing graphic design brings alive the board’s message and makes it easily understandable. The plotting board as an interactive element grabs children’s attention. In the process of creating and preparing the installation we had to ask for professional help from Siemens to order the locomotive model, since the factory we contacted did not plan to distribute their Vectron locomotive models until June. Therefore, it was very exciting that we managed to purchase two models for the interactive plotting table. We have to pay more attention to and factor in every little detail and potential obstacle during the planning process for the installations and their interactive elements.